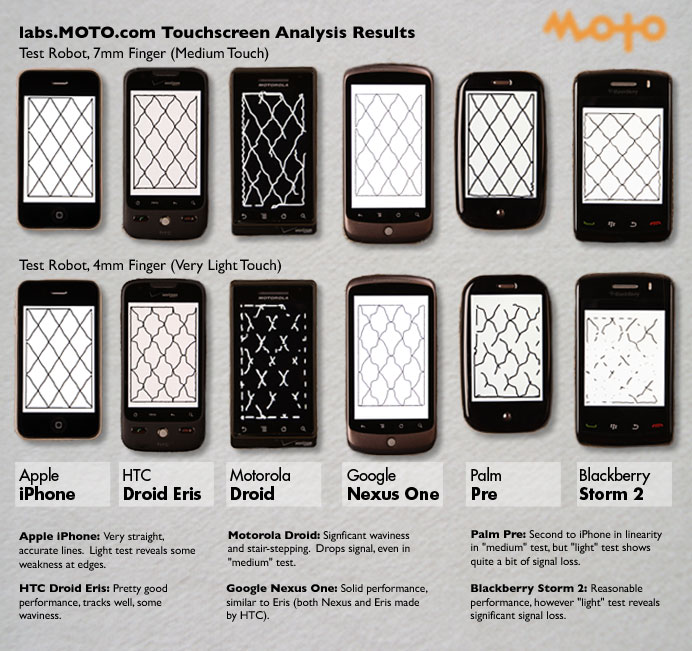 The test, conducted by MOTO Labs, compared an iPhone using the SimpleDraw application with a number of other touchscreen smartphones: Google Nexus One, Motorola Droid, Palm Pre, HTC Droid Eris, and BlackBerry Storm 2. As the company, which has no relation to Motorola, discovered earlier this year, the iPhone is in first, followed by the Google Nexus One in a distant second place. The test was done with both a 7mm robotic "finger," for a "medium touch," and a 4mm robotic finger to represent a "very light" touch. In both tests, the iPhone was found to have straight and accurate lines, with some weaknesses at the edge of the panel with the light touch. In second was the Nexus One, which MOTO said had "solid performance" much like the Droid Eris, also manufactured by HTC. Both handsets were also specifically named in Apple's patent lawsuit against HTC filed early this month. Apple has accused HTC of "stealing" its patented iPhone technologies, which include touchscreen capabilities. Both the Palm Pre and BlackBerry Storm 2 performed well in the medium test, but produced significant signal loss when the very light touch was employed. The poorest performer of the bunch was the Motorola Droid, which featured "significant waviness and stair-stepping," even with the medium touch test. In the light touch, signal drops were extremely common. MOTO noted that the touch panel alone does not make a good phone —it must perform well in combination with the phone's operating system to ensure responsiveness for the user. With that, the labs said they do not expect such a high level of variation to exist in future smartphones. "We know for a fact that the solutions in these phones (other than the iPhone) are all last-generation silicon and touch panel components —the other touch screen makers are hard at work perfecting their new solutions, and they may just leapfrog Apple in some areas when they arrive on the market over the next year," the report said.